Another brilliant novel from a writer who has quickly become one of the genre’s most successful and intriguing practitioners. I like the word “another” in that, I have to say. I’m basically gobsmacked to have received three starred reviews for Lock In (the other two being from Publishers Weekly and Kirkus); that’s the first time I’ve had that happen. I hope you guys like it as much as the reviewers have so far. Note: This entry will have spoilers about my book Old Man’s War — which, inasmuch as the book has been published for nearly ten years now probably shouldn’t been seen as spoilers anymore but never mind that now — so if you haven’t read Old Man’s War and don’t want a relatively important aspect of it spoiled for you, here’s the takeaway: Yes, there are trans people in the OMW universe; no, it’s not a problem for the CDF/Colonial Union that they are trans. There, now you can go ahead and skip the rest of this entry. I have been asked several times (and just yesterday, in fact, via e-mail), what happens to trans people who become part of the Colonial Defense Force in the Old Man’s War books. To recap, the CDF gets its soldiers by recruiting 75-year-olds from Earth and giving them new, super-awesome bodies that are based on — but not created solely out of — their own DNA. Because the creation of the bodies is only partly based on the recruit’s original genetic information, would it be possible to for transfolk to specify which gender they would like their new body to be? This is a really interesting question. Let me try to answer it. Let me note that with respect to Old Man’s War the book, I did not at all think about what would happen with trans people who join the CDF as I was writing it. Why? Short answer: Straight white male who didn’t know any trans people at the time, so it was not something in my consciousness. So everything from here on out is me adding commentary to the original text — but since it’s from me, the author, we can consider it canonical. 1. First off, and to be clear, there would be no bar to trans people joining the CDF, because why would there be? The entrance requirements are a) you’ve signed up, b) you come from what are in the book rich, developed countries (which mostly align with the current slate of rich, developed countries). So yes, there would be trans people among the recruits. 2. By default, CDF bodies come in classically male and classically female forms. Note that thanks to genetic engineering, etc, the performance capabilities of both male and female forms are equal, so the gender presentation is strictly for the psychological comfort of the recruit, i.e., you’re (usually) used to being male or female, so you get to stay that way when you transfer into your new body. 3. Because the body sorting is a matter of psychological comfort, to the extent that the CDF knows about a trans person’s gender identity, it’ll sort them that way. So, for example, a post-op trans person will be sorted into their post-op gender identity, regardless of DNA profile, because that’s the clear preference for that person. 4. What about non-op, genderfluid, intersex or trans people who have not made their preferred gender public knowledge? The CDF initially sorts into male/female by best appoximation and then after transfer follows up for additional modification. The CDF is an organization that can grow back limbs and organs with minimal effort (for them; it’s slightly more traumatic to the person growing them back), so modifying bodies for the psychological comfort of the person inside is a relatively trivial matter. Most of this can be handled before the recruits get to basic training, although particular in the case of trans people who are not public, much would be contingent on them telling the CDF doctors and technicians. 5. And no, the CDF wouldn’t care about the gender presentation of the recruits. What it would care about is them being willing to fight. You’ll fight? Great, here’s your Empee. Go kill an alien. Thanks. 6. Would there be some other recruits who would have a problem with trans people? It’s possible; the CDF lets anyone in. The basic training drill sergeants will be happy to tell them to get over it. If they did not (indeed if they did not get over any general bigotry) the results for them would be grim. 7. Could a CDF soldier decide to change their gender identity and presentation during the term of service? Sure, why not? All CDF bodies have the same baseline capabilities and personal identity can be verfied via BrainPal, so there would be no penalty or confusion on either score. Are you following orders? Killing aliens? Great — change your presentation however you like. 8. Likewise, when a CDF soldier leaves service, they can specify the gender identity and presentation of the body they’ll be transfered into. Because, again, why wouldn’t they? Short form: The CDF is happy to let trans people be who they are because it makes them comfortable with themselves — and that makes them better soldiers, which is ultimately what the CDF cares about. With regard to the Old Man’s War series, I have not intentionally written about trans people in it (some of my characters may have been trans but did not tell me about it), but there’s no reason why I could not. So maybe I will at some point, if there’s a way to do so that doesn’t look like me transparently trying to gather cookies to myself. But regardless of whether I’ve written trans people into my books, there are, canonically speaking, trans people in the OMW universe. Because why wouldn’t there be. Reponsibility! It’s a drag, right? 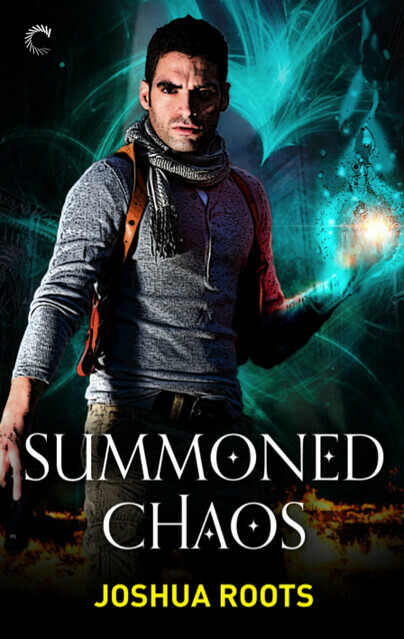 Not so, argues Joshua Roots, who explains how responsibility, and all the things around it, inform his latest novel, Summoned Chaos. Growing up, life worked pretty hard to instill in me a sense of responsibility for my actions. Don’t eat your veggies? No dessert. Forget to call Mom if you’re going to miss curfew? Enjoy staying home for the next week or so. Ask two girls out to the same dance? Good luck getting a date the rest of your 7th-grade year, pal. As a kid, responsibility was a burden, something imposed on me from the outside. Things like cleaning my room, eating veggies, and monogamy were crosses I had to bear. If I goofed up, I paid the price. Someone external (usually my folks) kept me in line, ensuring I stepped up to the plate for the responsibilities assigned to me or ones I’d volunteered for. I didn’t know it back then, but that was only half of the equation. Over time, the sense of responsibility became something that I realized through my own actions. Rather than my parents holding me accountable, I was doing it myself. Missing a homework assignment in high school or college meant I had to own up to my actions alone. Same with being flippant with a girl’s heart. Some of those lessons were learned the hard way, through poor grades or tears wept. But in the end, it was my choice to attend those classes or account for another person’s feelings. I’m not sure exactly when it happened, but one day I found myself paying my mortgage, filling out a grocery list, and making my bed. Voluntarily. And you know what? That was pretty cool. More important, it was empowering. Keeping the lights on and food in the fridge may seem boring and mundane, but it was symbolic. I wasn’t merely surviving, I was building my future. Commanding my life. Then I joined the Marines and that concept was ratcheted up to eleven. Responsibility wasn’t a burden, but a gift. Just as lives were entrusted to me, so too was mine entrusted to others. That responsibility became one of the greatest rewards because when I eventually moved on, I walked away with the strength to carve out my own future and the conviction to face whatever challenges came my way. Becoming responsible as an adult, while not always fun, does carry a significant amount of power. We begin to control our own destinies, make choices, and learn to deal with the consequences—good or bad—of those actions. More important, the responsibilities that we take on allow us to choose which paths we want to navigate through life. No matter what, those paths are filled with challenges. Accepting those challenges and working to overcome them empowers us. It teaches us we can do better, maybe even become more than we think we can be. It gives us the confidence to move forward. The Big Idea for Summoned Chaos, Book 2 in The Shifter Chronicles, centers on this theme. The main character, Marcus, is making the transition from being begrudgingly accountable for his actions to willingly accepting them. He’s not only dealing with the fallout of Book 1, but also realizing that there is a certain amount of power that comes from bearing the load of his family name, of serving the governing council of his magical society, and of being responsible for someone other than himself. Rather than responsibility being a burden he must carry, Marcus, much like the rest of us, comes to realize that it is a weapon to win life’s battles. He is no longer a “lone wolf” caring for his own needs. Instead, he’s taking on the responsibilities of a team, his loved ones, and the defenseless humans he’s sworn to protect against paranormal creepy-crawlies. By doing so, he gains the strength and confidence to face the troubles ahead of him. And trust me, there are a lot of them. Visit the author’s website and blog. Follow him on Twitter.